Silence of the Yams… | sondai living: Spirit. Art. Style. My grandmother had high cholesterol and high blood pressure. I remember when I was in 9th grade she had to take pills for it but she would retain water because of the pills. The doctor recommended that she eat certain foods and use Mrs. Dash. She did. Her favorite daily delectable… a sweet potato for lunch. She would sit and scrape the inside and flip it until the orange flesh was completely gone. She would tell me “I could eat these for breakfast, lunch and dinner.” My grandmom died from Alzheimer’s a couple of years ago but I believe she is living through me because I most certainly have an obsessive affinity for sweet potatoes. Normally who thinks about all of the details of whole food? We are constantly monitoring whether something has high sugar or fat or wheat or gluten. We need to consider the benefits of the whole foods we eat and eat more of them. So for dinner… a raw salad of baby spinach, kale, cucumbers, red pepper, artichokes, grape tomatoes and salmon seasoned with lemon, salt, pepper and chives with a lemon and olive oil dressing. All because I actually forgot to buy the sweet potatoes while I was at the grocery store. 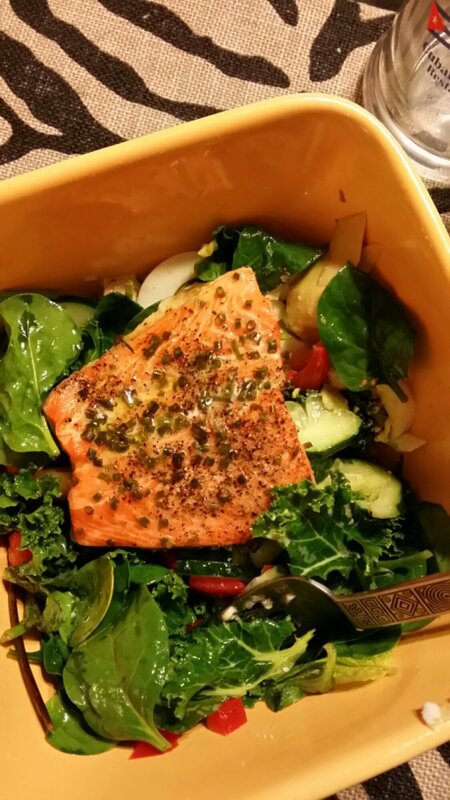 This entry was posted in Healthy Eating and tagged Alzheimer's, raw foods, salad, sweet potato, yams by kimberly c. gaines. Bookmark the permalink.